Consumers love buying locally grown produce. But these days, it seems consumers are also dictating how farmers should grow their crops. This is influencing how farmers do their job and keeps them from using beneficial farming technologies that can provide healthy food, be kind to the environment, and help them make a living. More and more mindful consumers are getting to know the farms in their area, attending farmers’ markets, and supporting local growers. 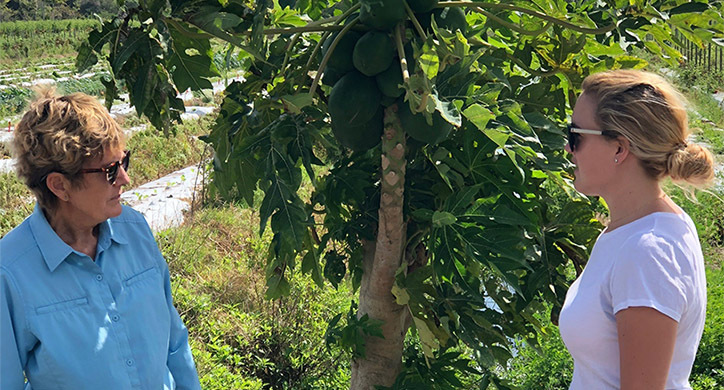 And while connecting with farmers and understanding how your food is grown is important, dictating how a farmer should best grow their crops resembles a patient telling a doctor which medicines to prescribe! As a result, organic practices have been overemphasized and the use of genetically modified technology is very limited. The question remains: Is it clear to the consumer how safe conventionally grown fruits and vegetables actually are? There seems to be an inextricable link between local and organic produce. Consumers often assume when they are buying local, they are also buying organic. According to a survey done by Statista, 96% of those surveyed believe “local” means the produce was grown within 100 miles, 57% think that it is produced by a small business, and 44% believe it means natural or organic. 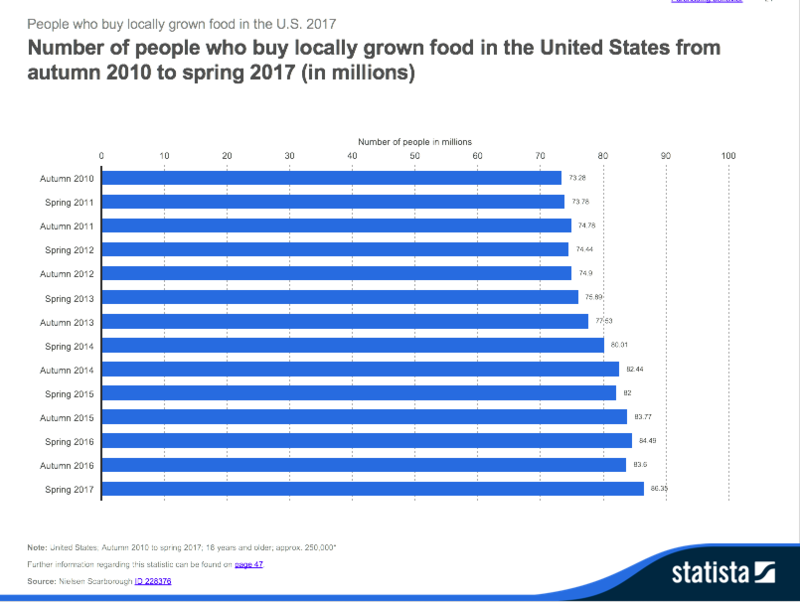 As shown in the chart below, despite the lack of clarity around what “local” means, more and more consumers are visiting farmers’ markets to buy just that. 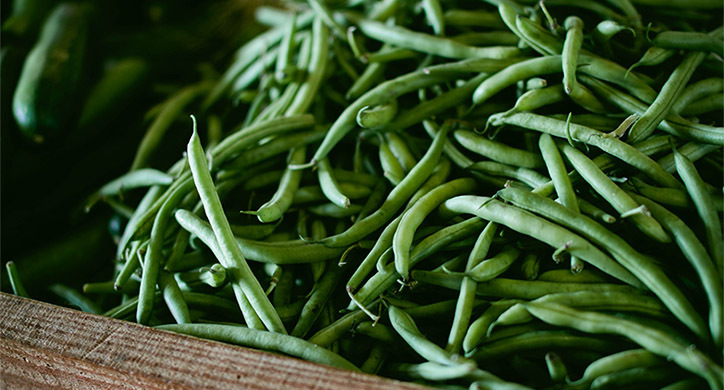 In reality, local does not mean organic— and there is nothing wrong with that. Despite this fact, there is a push for farmers to produce only organic crops for their local farmers’ markets. However, what the consumer doesn’t always realize is that both organic and conventional farmers have bugs, weeds, and weather issues. 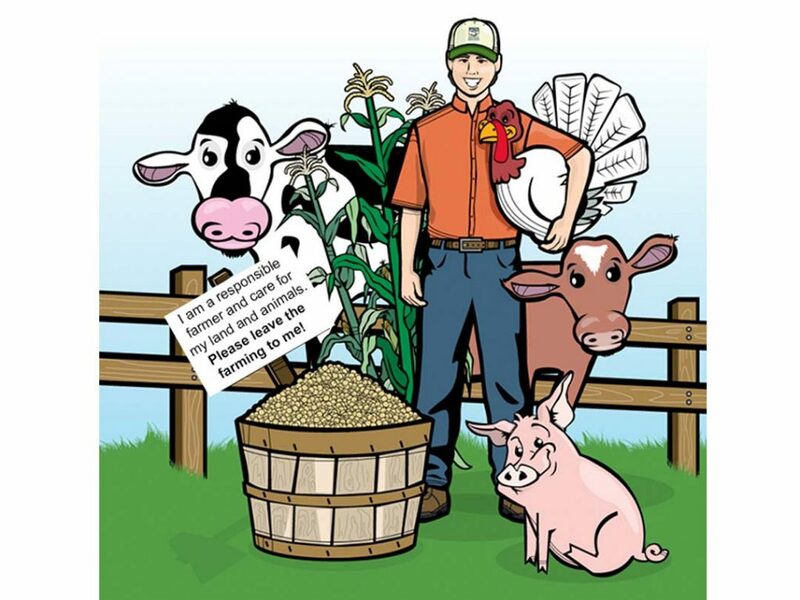 In order to get a good yield, farmers must utilize a variety of different tactics. Sometimes this includes pesticides, sometimes herbicides, and sometimes both. Farmers are concerned with soil and their local environments’ health. When it comes to growing practices, it isn’t black or white. Yes, farmers are often classified as conventional or organic— but there is a lot more to it than that. In fact, conventionally grown crops are often misrepresented and pitted against organic produce as the greater evil. 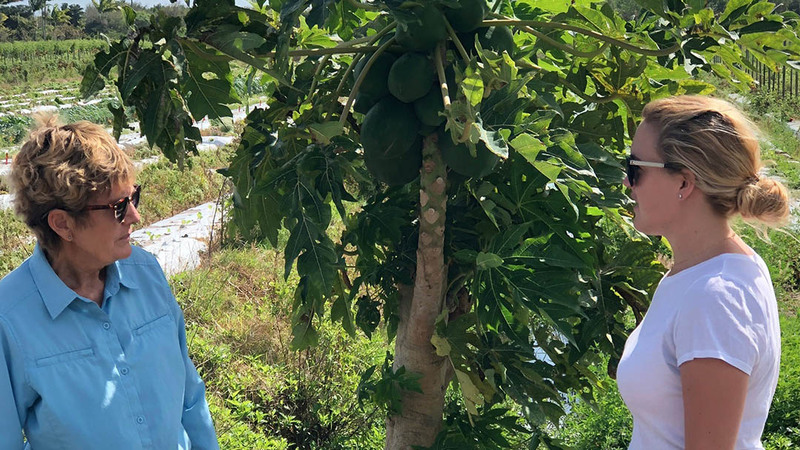 As we’ve discussed on D2D, conventional farmers create safe, healthy, and affordable produce. 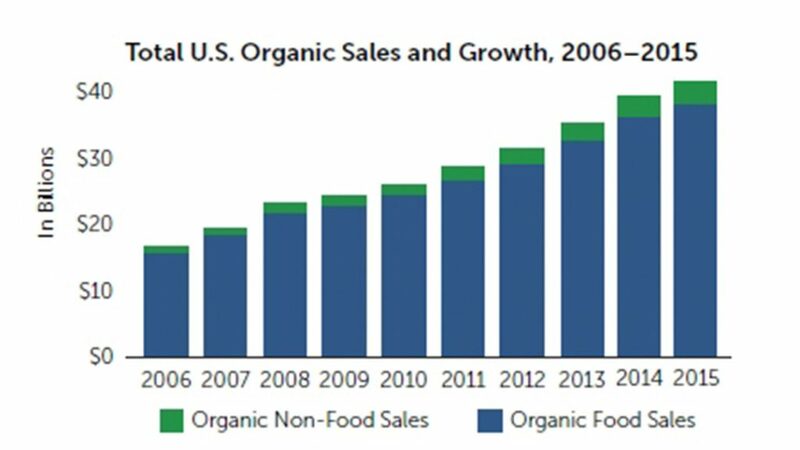 But many consumers still believe that organic is healthier and more nutritious because it doesn’t require pesticides or herbicides. This impression is misguided. 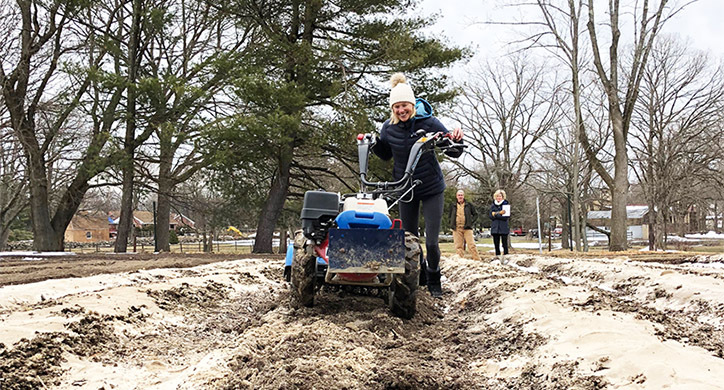 For instance, conventional farming practices have traditionally been held to a higher sanitation standard than organic farming, which sometimes uses improperly composted manure as opposed to more sanitary synthetic fertilizer. Or organic farmers may use copper sulfate as a fungicide and pesticide, which can be more toxic to the environment, including bees, than the conventional treatment of glyphosate. 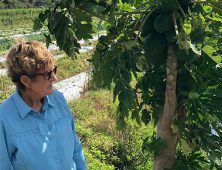 As we learned on Green Cay Farm in Florida, there are many challenges that farmers face when growing crops. These include, but are not limited to, pest pressure and maintaining healthy soil. Sometimes, to deal with these challenges, a conventional input is better for the land, the farmer, and the crop. 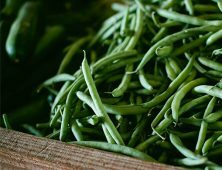 D2D discusses conventional farming practices with Nancy Roe of Green Cay Farm. 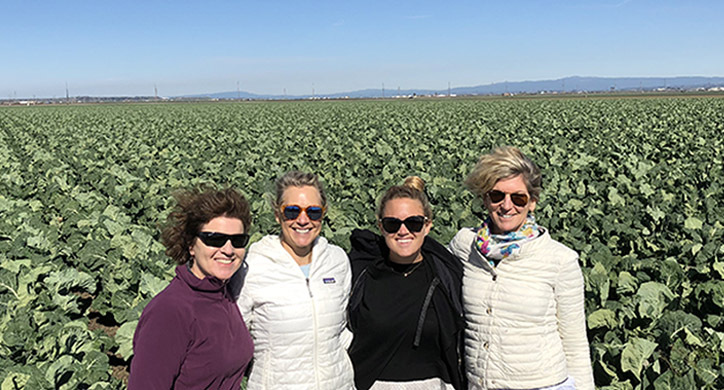 In the case of Green Cay Farm, genetically modified technology could have a significant impact on the quality and availability of their corn and squash crop and would ultimately increase the profits of the farm. As Nancy Roe told us, she would like to use GM seeds but that could negatively affect her CSA subscribers. If she were able to use genetically modified crops she could yield more on less land and apply 1/3 less pesticide to her crops. 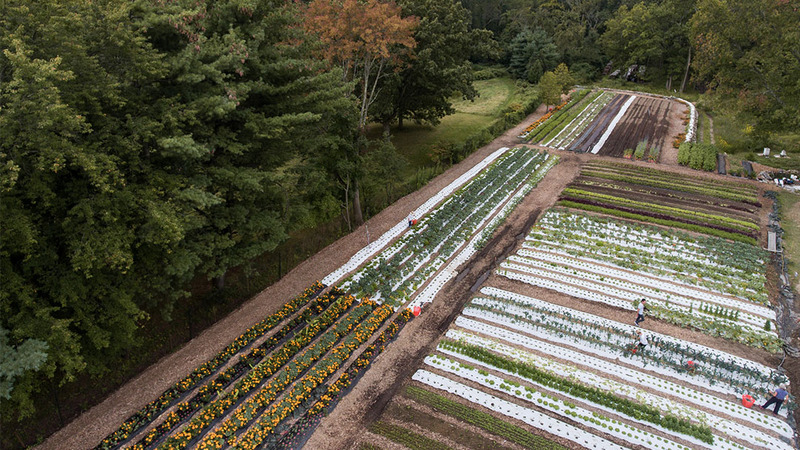 Versailles Farm, in Connecticut, takes another approach. Here, the “French-intensive method” is used to grow a variety of lettuce crops, tomatoes, squash, cucumbers, peppers, edible flowers, and mushrooms. This approach combines conventional and organic inputs to produce roughly 12 acres of food on 1.5 acres of land! Versailles Farm. The tightly packed rows using the French intensive method produces on 1.5 acres what would normally require 12 acres. 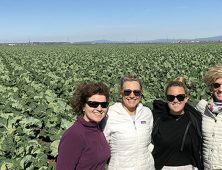 For Versailles Farm, “best practices” means fully utilizing new technologies like soil moisture sensors, irrigation sensors, and (if necessary) synthetic inputs based on detailed soil analyses. The owners, Steve and Ingrid McMenamin combine this with more old-time techniques, like the broad fork, which is a hand tool used to crack the soil before planting to allow oxygen in without disturbing the all-important microbiome of the soil web. They also grow companion plantings, like marigold flowers, nasturtium, lavender, and dill in order to naturally fight off pests. For example, lavender repels cabbage worms. They can then harvest these companion plants for additional revenue. The bees are able to pollinate the flowers and create the honey made on the farm. 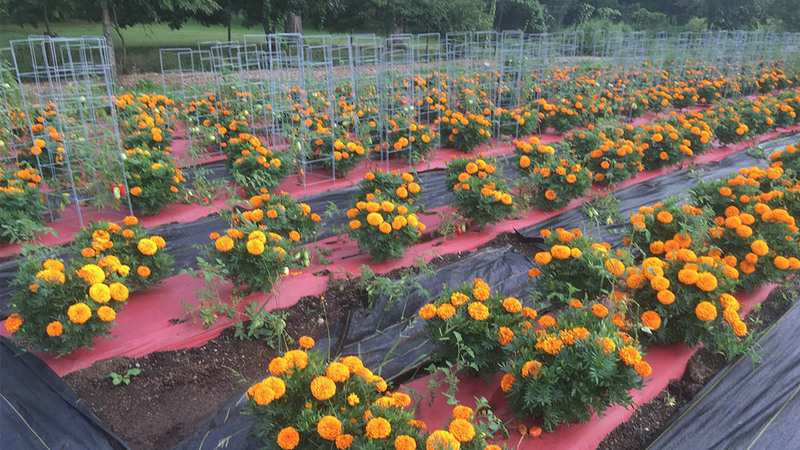 Versailles Farms grows thousands of marigolds in between crops. Acting as a companion plant this little flower is repelling insects, preventing fungus and keeping everybody healthy. Their roots contain thiophene which is toxic to certain nematodes, aphids, and beetles. Marigolds also attract beneficial insects. The health and quality of a farm’s land are extremely important to both conventional and organic farmers. If farmers don’t manage their inputs properly they are wasting money, negatively affecting their crops, and hurting overall profitability. We must trust both conventional and organic farmers to do what is right for their land given their seasonal challenges, pest threats, and growing conditions. Get to know your farmers, and you will be pleasantly surprised at the care they take of their land—even if they aren’t solely organic. Successful farms are those who can marry the best techniques that are applicable to the crop, the soil, and the environment. It is not just one or the other – it can be both! A big thank you to Steve and Ingrid McMenamin from Versailles Farms and Nancy Roe of Green Cay Farm and Farming Systems Research. Farmers need to be properly supported by consumers. The quality of the yield that comes from a farm isn’t because of the conventional or organic inputs. It is because of a farmers ability to understand the land, adapt to weather and pest challenges, and utilize best growing practices throughout the seasons.